A Special Christmas Reunion Few people in Laramie, Texas, know that Merri Duncan is actually the biological mother of her late sister's twins. Even fewer know that Chase Armstrong, and not his late brother, is their biological father. 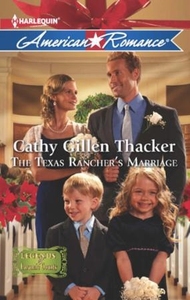 It's even news to Chase - and when he returns from military duty, he's determined to do the right thing by Merri, who's been raising the twins alone on the Broken Arrow ranch. It's time for a walk to the altar, for the sake of the children. There's just one problem. Merri and Chase are, as they always have been, just friends - nothing more. Without love, their marriage can never be truly complete. Sticking it out may mean sacrificing their chances for future happiness. But maybe faith, hope, and desire can bring these two newlyweds what they truly need. After all, it is the season of miracles.